The Japanese Garden is at Brisbane Botanic Gardens Mt Coot-tha. It was originally an exhibit at the Japanese Pavilion at Expo '88 held at South Bank. 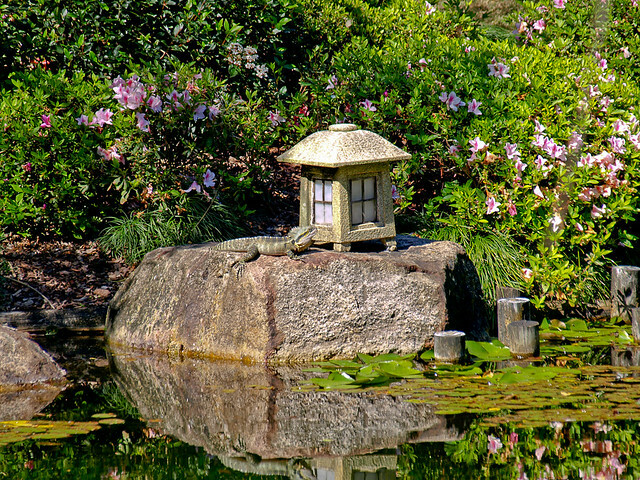 The Japanese Garden was gifted to the people of Brisbane and opened in February 1989. One of Japan's leading landscape architects, the late Kenzo Ogata designed the gardens. The theme of the garden is ‘tsuki-yama-chisen’ or 'mountain-pond-stream'. It features the key elements of stone, water, ornaments, arbours, paths and vegetation. Japanese gardens are usually evergreen gardens. This garden contains a combination of native and exotic plants suitable for Brisbane's subtropical climate. Single trunked trees lean over water or pathways. Gardeners carefully prune shrubs to create a sense of open space and to frame views. You can view the Japanese Garden photo gallery as a slideshow. Alternatively, view the photos individually in the Japanese Garden set in Council's Flickr account.